With PTC system, Down Line Builder, URL Rotator and so much more. 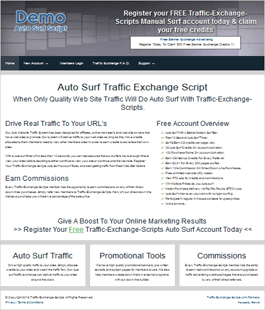 The Traffic-Exchange-Scripts auto surf script offers a great opportunity to anyone wishing to start their own traffic exchange. Our competitors sell this style of Traffic Exchange Script for approximately $150 - $580+. Do not miss out on your chance to get your Traffic Exchange Script today at a price that is much lower. The auto surf script has been coded in PHP and MYSQLi the script has been designed to run natively on PHP7, You can rest assured the script will work for years to come. You don't want to get stuck with an inferiour script that runs on old outdated code (php4 etc.) Our auto surf traffic exchange script is the perfect solution for anyone considering starting their own auto surf traffic exchange business. Order Your Copy Of The Auto Surf Script Today And Download Instantly! With this Auto Surf Script your traffic Exchange could be up and running in a just few minutes from now. The Script comes with an easy to follow setup guide and is easy to install. The script is totally customizable and has no annoying code encryption. This means your traffic exchange script can be modified to suite your needs. Our auto surf script comes with a members paid to click area (can be enabled or disabled) where the site administrator (You) can set if the members earn either auto surf credits or cash. A down line builder (can be enabled or disabled) with integrated splash pages where you are able to add, remove, update programs at any time. If enabled by you the site administrator your members can also make use of an Unlimited random URL rotator where members can promote sites efficiently on external sites while still promoting Your site. Now with member contests, You can choose from 5 contest types (number of pages surfed, unique splash page views, points earned, ptc views, new referrals) & award 4 different contest prizes (cash, credits, banner impressions, text ad impressions, points) and more with awards being fully automated. Contest standing and Previous winners pages are also included in members area. A brief overview of the traffic exchange members area. Fresh Responsive Web Site Template. Members can auto surf for credits. Adding / changing / deleting URL's. Automated frame breaker testing of URL's. Assigning of auto surf credits. Releasing of auto surf credits. Changing of approved sites status. Updating of registered e-mail address. Updating of pay-out e-mail address. Purchase additional auto surf credits. Purchase variety or additional products. Upgrading of traffic exchange account (subscription). Automated member PayPal Purchase delivery. Automated member Payza Purchase delivery. Automated member STP Purchase delivery. Automated member Points Purchase delivery. Automated member Crypto Coin Purchase delivery. Variety of crypto coins can be used to purchase. Viewing of earnings and commission history. Request cash out of earnings once minimum achieved. Viewing of 7 days of exchange traffic statistics. Earn traffic exchange credits for referring members. Great external program down line builder. Top exchanger rewards (surf boost, top surfer ads). Can resend account activation email. Can initiate lost password reset. Free to use random URL Rotator. Participate in 5 types of on-site contests. Earn commission on down-line purchases (set via admin). Advertising of Banner ads on site. Advertising of Text ads on site. Earn points via offer walls (set via admin). A brief overview of the traffic exchange admin area. 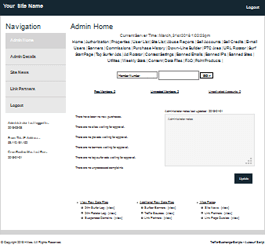 Changing site admin login info. Setting of bonus auto surf credits for new members. Set pages to surf before members can assign credits. Set credits and cash users can win while surfing. Updating, viewing of members account info. Setting surf timer for each member upgrade level. Ban, Suspend Undesirable users and web sites. Delete, Pause, Enable or Suspend sites. Sell advertising products (13 products pre added). Sell account upgrades with account specific settings. Sell Upgrades and products for points. Set time frame users are classed as inactive. Add / Edit / Deny Top Surfer Ads. Enable or disable down line builder. Add / Edit down line builder programs. Generate down line builder splash pages instantly. Enable or disable splash page credits. Mailer - email to Free, Upgraded, Inactive members. Great on-site Banner Ad Rotator (with grouping). Enable or disable member Paid to Click. Paid to Click manager, Approve, edit & delete ptc ads. Set commission percentage for each account type. Set max site limit per account type. Run 5 types of in-house contests with alt prizes. Modify contest settings and winnings. Modify surf start page when ever you want. Can enter link partners links (links to other sites). Can enter on-site news (shown in members area). Please note: Above demo script is for demo purpose only. Any changes made will not be saved. Top level domain or sub domain. MYSQLi & PHP 5.4+ installed. Ability to run CRON jobs (not essential). FTP Access & CHMOD rights. The auto surf script makes use of an additional points system that you can disable, where your members can earn points for surfing, as contest winnings or earn them in bulk by completing CPA tasks where your members earn a set number of points for every dollar you earn. Points can then be used by members to purchase on-site advertising, upgrading of accounts etc. Points purchases are fully automated much like our PayPal, Payza, Solid Trust Pay & Crypto IPN's. Administer your auto surf traffic exchange via a built in administrator back-end or create sub admin accounts. "This is an awesome traffic exchange script and great support, I would recommend it. If you are looking for a good place to start then you found one here." "The script is very simple and good. The support is very fast within 5 hours I was helped. Keep it up Greetings Manny"